I’m an adventurous eater, but Mister H is far more so than myself. He’ll stretch to offally, brainy, insidey bits that I just can’t get my head around. He’s not silly though, he has the same train of thought as myself in the fact that if you’re ever going to eat something that challenges your brain, eat it in a fine dining restaurant. The things a great chef can do with wacky ingredients is always inspirational and if you can put your judgemental ‘but I don’t like that’ pouting brain to one side and just chew, you may find yourself pleasantly surprised. I have eaten rabbit a couple of times, always in this very situation. A brilliant chef has pimped my bunny so it’s unrecognisable and served stacked or drizzled and foamed and I eat a tiny morsel for an exorbitant cost. It may not sound like it, but I bloody love fine dining. Another thing that has become a rare treat since spawning. I’ve had rabbit rillettes, and rolled stuffed rabbit, both with martinis and wine under my belt, so I can’t properly recall the subtle nuances of the dishes. Anyhoo, I’ve wanted to try cooking a rabbit for a few years but I’ve always been too….too…..ummmm, nervous? wary? The only whole animal I’ve ever dealt with is a chicken and they’re not really cute in life so it doesn’t phase me. Does that make me shallow? I have to admit to you that when I had that whole rabbit on my chopping board, I was a little bit challenged. Jointing it and prepping it wasn’t exactly difficult, but it’s sure not buying your cut ready from the butcher. If you’re trying this, you can do that FYI, but I really wanted to do the full Monty. I thought I would turn to the doyenne of cooking, Maggie Beer, for a little help with this. She’s into the down-home, on the farm, rustic stuff so I had a feeling she was going to be my best ally. 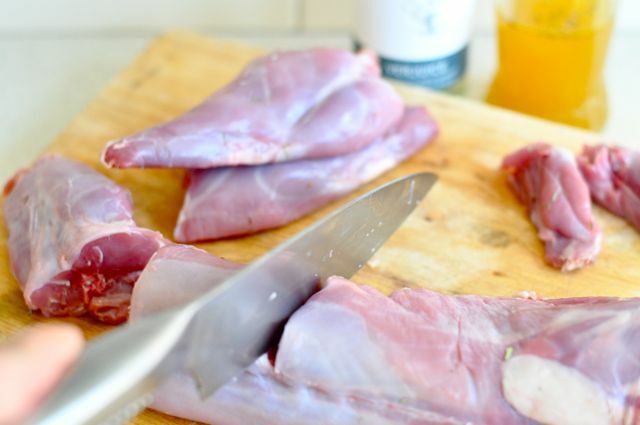 Her recipe called for a fat, farmed rabbit and all I could find was a wild one, so I knew that I would need to adjust my cooking time accordingly as wild rabbits are much leaner and therefore would have a tendency to become tough if not treated with the appropriate love and care. She also called for the kidneys and liver, but you know what? I’m challenging myself plenty enough as it is, thank you very much, Mrs Beer. I also need lemon thyme but baby brain made me grab rosemary instead. Dufus. I’ve used dry thyme instead. Joint your rabbit into front and back legs and saddle. Cut your saddle into three or four pieces. Using a sharp knife remove any sinew from the saddle. 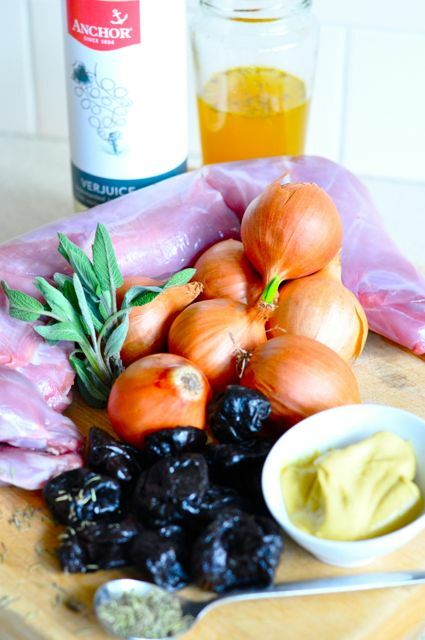 Combine your rabbit pieces with mustard, sage, thyme and olive oil. Cover with plastic film and leave at room temperature for one hour. Meanwhile, blanch onions in a saucepan of simmering water for 10 minutes. Cool slightly, then peel and set aside. 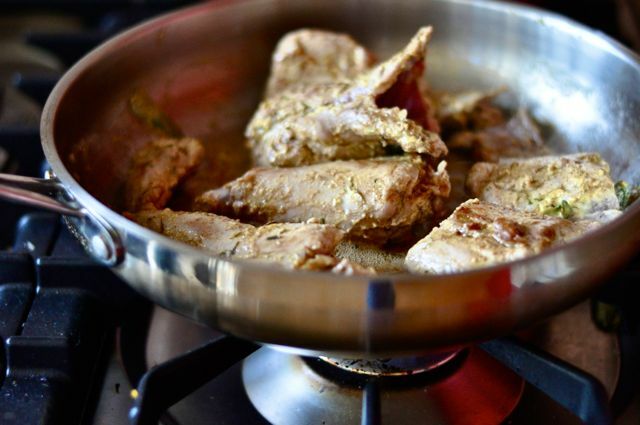 Heat your butter with a little olive oil added in a heavy based fry pan over a medium heat until it is nut brown. Add rabbit pieces and gently cook over a low heat, turning occasionally, for 4 minutes or until lightly coloured, then take out of pan and set aside. 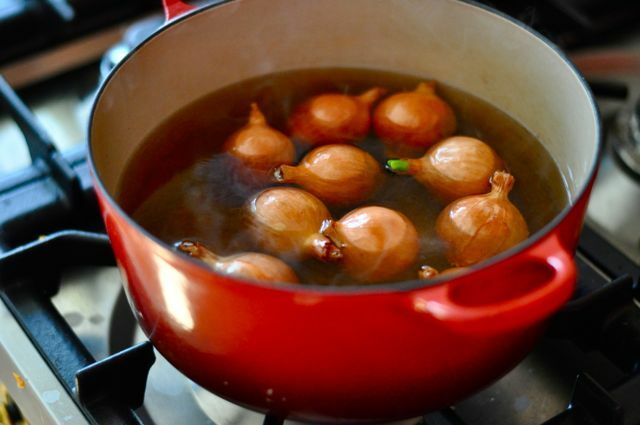 Toss your onions into the pan and give them a little colour for 5 minutes or until golden. Return rabbit to pan, add prunes, then deglaze with verjuice. Add your stock and simmer, covered, over a medium heat for 6 minutes. Turn rabbit pieces over, then reduce heat and cook until tender. Saddle pieces are cooked when they feel pliable to the touch, and muscles separate easily from leg bone. If cooked, then remove and set aside to rest. Otherwise, continue cooking until tender, taking care not to overcook. Remove rabbit, then simmer pan juices over a high heat until reduced and syrupy. Return rabbit to sauce, season to taste and serve. I served it with delicious creamy parmesan polenta and asparagus. Well, it was delicious, if a little tough. I think next time, if I had a wild rabbit, I will go for a slow cook and aim to make it falling it apart yummy because the flavour of this was all that! I would only use farmed rabbit for this recipe, however, I think chicken or pork would be great with these flavours. I don’t know if I’ll do it again, to be honest. That said, this dish would be kick-arse with chicken or pork. 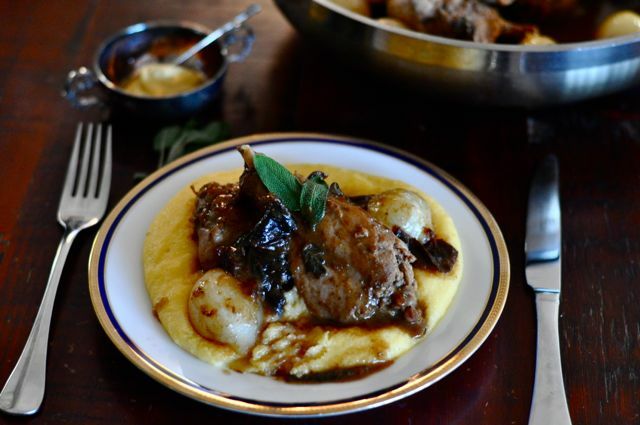 Didn’t know Elmer Fudd had entered into the food blogging business :D. This looks wonderful – what a great recipe! I think I shall follow. Elmer’s branching out into the world wide web!